Darren Williams says he is “gutted” after being axed as manager of Whitby Town, and feels he has been “let down” by the club. The former Sunderland star was sacked by the Blues on Monday afternoon, after more than four years at the helm. “It still hasn’t sunk in, I’m just gutted,” Williams told the Whitby Gazette. “I accept that the results haven’t been good enough, but I think we were starting to turn things around, performances have certainly been better in recent weeks. “Yes, this is a results business, but I still feel massively let down by the club, and I’ve told [chairman] Graham Manser this. 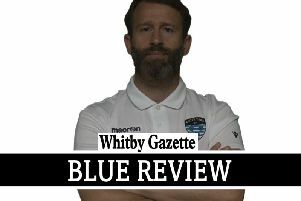 “Both Dave Campbell and myself have put a lot into Whitby Town during the last four years. The club were all-but-relegated when I took over and I like to think that we’ve made progress in the time that I’ve been in charge. Following Williams’ sacking, the club released a statement expressing their regret at having to part company with their management team. Chairman Manser said: “This is a great shame. Darren Williams is a lovely, lovely man and Dave Campbell has been a loyal servant for over 20 years, but the club must come first, and the committee felt that only gaining 14 points out of 63 was not good enough. Town named player-coach Lee Bullock as caretaker manager on Tuesday, and the former Cardiff CIty, York City and Hartlepool man will take charge of the side for Saturday’s home clash with Mickleover Sports. Whitby currently lie third from bottom of the Evo-Stik Premier Division standings, five points from safety, having won only three of their opening 21 league fixtures. More from Darren Williams, plus additional reaction in Friday’s Gazette.